This is the third of four reviews scheduled for Tuesdays in March. Each review will cover one of the first four volumes of the South Carolina Regimental-Roster Set series from Broadfoot Publishing Company. A significant portion of each review will show you how this particular volume compared to the others in the series in terms of regimental history length, amount of annotation, depth and print size of rosters, bibliography, illustrations, and maps. I do this to show readers just how different each volume can be. The South Carolina Regimental-Roster Set bears a striking external appearance to the H.E. Howard Virginia Regimental Histories series. These books were, in fact designed as a South Carolina answer to the Virginia unit histories. Broadfoot hopes to publish 50 volumes in this set, but that plan is dependent on how well these and subsequent books in the series sell. If you are interested in seeing this entire series printed, I encourage you to pick up these volumes immediately rather than put off purchases until later. Wadsworth, Mike. The 13th South Carolina Volunteer Infantry C.S.A. Broadfoot Publishing Company (2008). 333 pages, photos, maps, roster, notes, bibliography. ISBN: 978-1-56837-410-9 $35.00 (Hardcover). Mike Wadsworth’s new book on the 13th South Carolina Infantry continues the fine start to Broadfoot Publishing’s South Carolina Regimental-Roster Set despite some issues in the regimental history portion of the book. The focus here is on the roster for the regiment, compiled from a variety of sources and the most informative roster of the 13th South Carolina ever created. The 13th South Carolina was organized in 1861 and later brigaded with the 12th and 14th South Carolina under Brigadier General Maxcy Gregg. The 1st South Carolina and Orr’s Rifles joined the brigade in time for the Seven Days, and the 13th served with the Army of Northern Virginia for the rest of the war. The regiment was involved in the capture of Harpers Ferry and later helped to save the Army of Northern Virginia from disaster at Antietam. At Gettysburg, they were heavily involved in the fighting on July 1 but saw no significant combat on the following two days of battle. Like their sister regiment the 14th South Carolina, the 13th’s most important role of the war probably occurred on May 12, 1864, when the brigade along with several other units was tasked with the role of holding off a determined Federal assault on the Mule Shoe salient at Spotsylvania Court House while a new line was created nearly from scratch behind them. After nineteen hours of combat the new line was finally complete, and the 13th withdrew in silence. Once the fighting settled around Petersburg, the 13th found itself involved in both Battles of Deep Bottom in July-August 1864, in the fighting around Peebles’ Farm on September 30, 1864 and in a last gasp action at Sutherland Station in April 1865. They surrendered with the rest of the Army of Northern Virginia at Appomattox. Author Mike Wadsworth is the proprietor of First Corps Books (no web site) in Columbia, South Carolina. He is also a past President of the Columbia (SC) Civil War Roundtable. The regimental history of the 13th South Carolina is the third longest of the four books at 82 pages. Author Mike Wadsworth got off to a good start with an overview of how each company was formed, where the men were from, and gave their general socio-economic background. When the book moves on to the battles the 13th South Carolina participated in, however, there is an overreliance on the official reports of officers and on J.F.J. Caldwell’s famous book A History Of A Brigade of South Carolinians Known First as “Gregg’s,” and Subsequently as “McGowan’s Brigade. The author does very well leading up to and after battles, but he leaves all descriptions of the fighting to the men who were there. This was very noticeable and detracted from the enjoyment of the narrative. In many cases the actions of McGowan’s Brigade are covered with no special regard to the 13th‘s role in the fighting. In these instances I would have liked to have seen the author “fill the gap” in knowledge, so to speak. More analysis and clarification was needed as to how the 13th South Carolina performed. In these cases I got the sense I was reading a history of the brigade as a whole rather than one of this specific regiment. The author in some cases also had typos and errors in spelling. Examples include the incorrect assertion that the Army of Northern Virginia officially organized into two corps in July 1862 rather than after Antietam, a reference to “Burnside’s Division” at Antietam rather than his corps, and the statement that the battle of Gaines’ Mill was fought in 1861 rather than 1862. With all of this said, I do not want to seem overly critical of the unit history. An interview with Broadfoot Publishing owner Tom Broadfoot, which will appear later this month, confirmed that the author was asked to write a short sketch rather than a fully fleshed out regimental history. There was a lot of good information contained within this area and aside from the constant insertion of lengthy reports to cover battle situations I found this to be an enjoyable read. Much like Lee Sturkey did in his history of the Hampton Legion Infantry, Wadsworth covers the Petersburg Campaign in a similar amount of detail as the 13th South Carolina’s other actions. In my experience this is not very common for many regimental histories of Eastern regiments of both sides. Two maps, one covering the role of McGowan’s Brigade at Spotsylvania Court House and another which represented the winter camps of the brigade in the siege lines at Petersburg, were included at the end of the unit history. The maps would have been more useful had they been inserted into the text at the appropriate spots. The detailed roster is the most valuable portion of this book, covering the 1473 men who fought with the 13th South Carolina during the war. The roster is organized in alphabetical order by last name and is not broken out into companies. The first information for each man is the company he first belonged to. Like two of the other three books in the initial print run of The South Carolina Regimental-Roster Set series, Wadsworth’s book has the rosters printed in large type, making them very easy to read. The wartime information contained in the roster was compiled mainly from the CSRs (compiled service records) of each soldier, while earlier and later information was collected from a variety of other sources according to Broadfoot’s web site. The 13th South Carolina Volunteer Infantry C.S.A. includes an appendix covering the field officers and staff of the regiment throughout the war. A short bibliography on pages 322-325 is notable for its mention of several internet sources. The five pages of endnotes cover the regimental history but not the roster. Oddly, an index is not included. 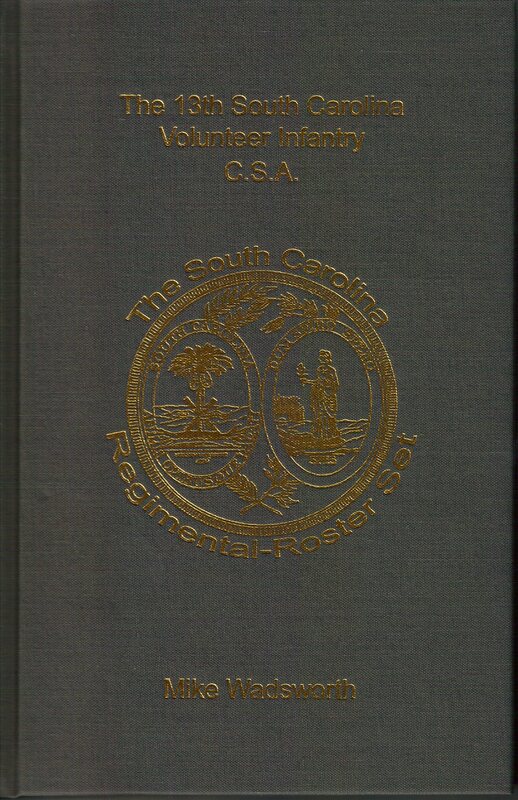 Mike Wadsworth’s book The 13th South Carolina Volunteer Infantry C.S.A. provides readers with a serviceable regimental history, but the larger source of value in this book lies in the detailed roster of the regiment. Researchers, especially those interested specifically in the 13th South Carolina, will find this book to be of great value. Those with ancestors in the regiment will also find the book useful. General students of the Civil War with no particular interest in the 13th South Carolina and those looking for a definitive regimental history may want to wait for a more detailed account or refer back to Caldwell’s history of the brigade. I would like to thank Tom Broadfoot at Broadfoot Publishing Company.